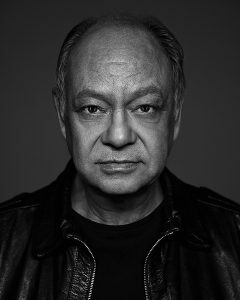 Counterculture legend Cheech Marin came of age at an interesting time in America and became a self-made counterculture legend with his other half, Tommy Chong. 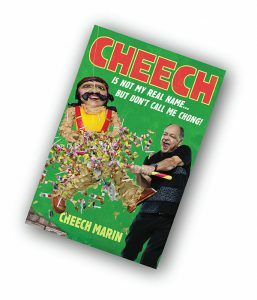 Cheech Is Not My Real Name: …But Don’t Call Me Chong is an insightful memoir that delves into how Cheech dodged the draft, formed one of the most successful comedy duos of all time, became the face of the recreational drug movement with the film Up in Smoke, forged a successful solo career with roles in The Lion King and, more recently, Jane the Virgin, and became the owner of the most renowned collection of Chicano art in the world. Written in Cheech’s uniquely hilarious voice, his memoir will take you to new highs. Free author talk with introduction by Emmy and Peabody Award-winning journalist Geraldo Rivera and moderated by comedian Jeffrey Gurian followed by book signing. Personalizations and line photo opportunities acceptable, time permitting. No memorabilia signed. Ticketed author talk moderated by Andy Kahan, Ruth and A. Morris Williams Director of Author Events, followed by book signing. Tickets are $15 general admission and $7 students. Signed books will be sold on site by Joseph Fox Bookshop separately. Personalizations and line photo opportunities acceptable, time permitting. No memorabilia signed. Ticketed author talk moderated by Marisol “La Marisoul” Hernandez of GRAMMY Award-winning La Santa Cecilia followed by a musical performance by Cheech with La Santa Cecilia and a book signing. Tickets do not include book purchase and are $45 Premiere ($42 Library Foundation Members) and $25 General ($22 Library Foundation Members). Service and handling fees applicable. All sales are final. No refunds or exchanges. Book purchases are separate and require proof of purchase that evening for signing. Personalizations and line photo opportunities acceptable, time permitting. No memorabilia signed. Ticketed author talk moderated by novelist Susan Straight (National Book Award finalist and Distinguished Professor of Creative Writing at the University of California Riverside) followed by book signing. 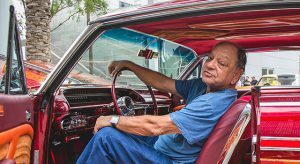 Tickets are $50 Premier ($40 RAM members), which include a copy of Cheech’s memoir, a drink, and a place in the signing line OR $20 General Admission (does not include book purchase). All sales are final. No refunds or exchanges. Personalization and line photo opportunities are acceptable, time permitting. No memorabilia will be signed. Ticketed author talk moderated by Los Angeles Times journalist Carolina A. Miranda followed by book signing. Tickets are $90 Premiere; $75 Level A; and $60 Level B; which include a signed book and the designated seating assignment. Personalizations and line photo opportunities acceptable, time permitting. No memorabilia signed. Ticketed author talk moderated by American political satirist Will Durst followed by book signing. Tickets are $45 (which includes a book and a place in signing line) and $20 general admission (which does not include a book). Books can also be purchased separately that evening. Personalizations and line photo opportunities acceptable, time permitting. No memorabilia signed. Ticketed author talk moderated by Tim Sanchez followed by book signing. Personalizations and line photo opportunities acceptable, time permitting. No memorabilia signed. UPDATE: This event is SOLD OUT, but visit Facebook link above to learn how you can buy and pick up your signed book at Tertulia Coffee or Sanchez Contemporary! Ticketed author talk moderated by Ernie Manouse, host of Houston Public Media’s InnerVIEWS, followed by book signing. Tickets are only $27, which includes general admission seating and a signed book. Additional books must be purchased online at least 24 hours in advance or by calling (713) 523-0701 to reserve your copy for purchase on site. No books or merchandise purchased elsewhere will be signed. Arrive early because parking is limited. There is abundant street parking nearby. Pay in advance to guarantee seating and signed books. Personalizations and line photo opportunities acceptable, time permitting.